Decked out in a stylish combination of black and red, the Bosch TDA5070GB Steam Iron has all the appearances of a high-tech, highly efficient, and sleek steam iron. It has an ergonomic look that is sure to appeal to busy consumers who are looking to crank out wrinkle-free freshly-ironed clothes in as little time as possible. However, does this unit’s performance deliver what its sleek, high-tech, and efficient form factor promise? Any discussion of heat delivery and heat pressing has to begin with how much power the iron has to work with. At 3050 watts, this Bosch unit definitely has enough electrical juice in its disposal to make high temperature delivery possible. Compared to other units its class and product category, it is definitely not a lightweight as far as power is concerned. On the other hand, this unit is not overpowered and that is good news as far as your electricity bills are concerned. Finding a happy medium with household appliances’ electricity consumption is always a challenge. However, this Bosch steam iron seems like it has a good handle of balancing the need for enough electricity to reach high heat level while keep energy consumption manageable. While it isn’t going to win any green energy awards anytime soon, it offers decent balance between heating capacity, heat delivery, and energy efficiency. Almost all commercial steam irons can iron. They are all built to distribute heat across the flat bottom of the iron to produce a hot uniform. This is not the problem. In fact, this goes without saying. 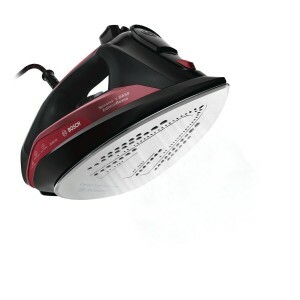 What separates one steam iron model from another is how well its steam process works. How evenly can it steam a flat surface? Can it be used vertically instead of just on flat horizontal surfaces? 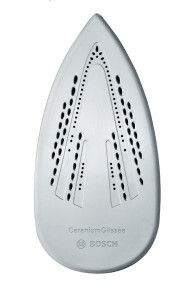 The Bosch TDA5070GB Steam Iron has a different design than other steam irons-its soleplate is made of ceramic. This produces a more efficient steam distribution pattern. Matched with the smooth surface of ceramic, pressing this unit smoothly against a flat or vertical surface produces less jerking or uneven coverage. Moving this unit across a fabric’s surface produces a gliding instead of dragging sensation. 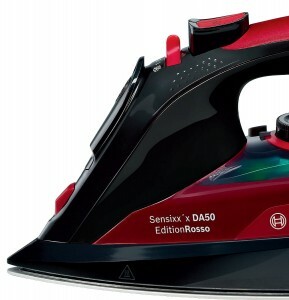 Not surprisingly, this smoother relatively friction-free steaming motion produces a more even and consistent ironing range of motion and flatter surfaces. In decades past, manufacturers aimed to produce such clean flat surfaces by making the soleplate of irons really really heavy. Not so with ergonomic models like the Bosch TDA5070GB. Its heavy and well-distributed steaming power complements its light weight to produce flat crisp ironed surfaces quickly with relatively minimal effort. This leads to more efficient ironing since you don’t have to make repeated passes at a section of the fabric you’re ironing to make sure its flat and wrinkle-free. 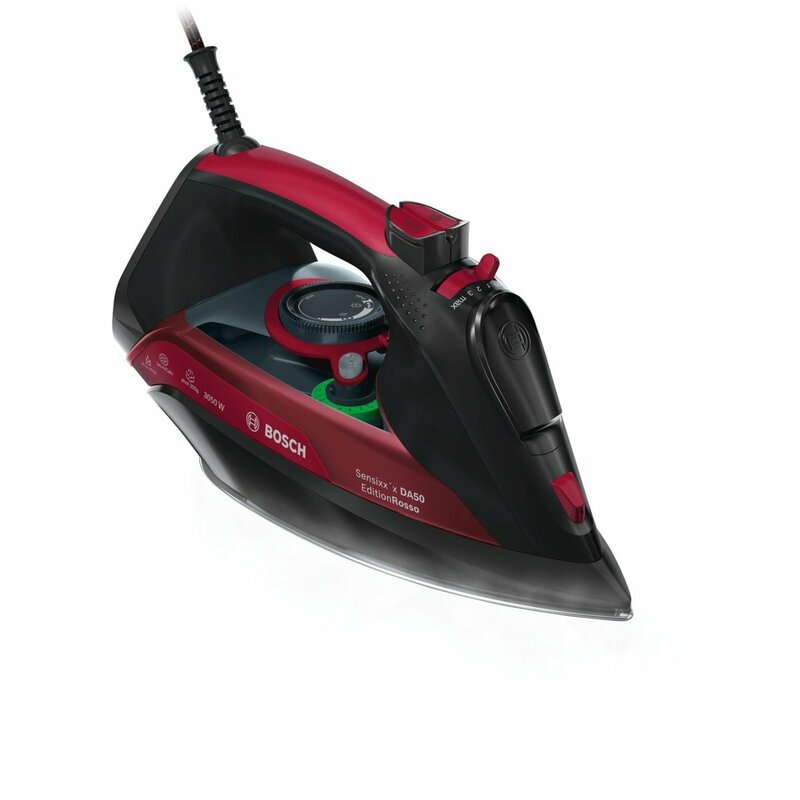 Most importantly, steam irons need to be compared based on their steam output per minute. The more grams of steam a unit puts out per minute, the better. The higher hot moisture volume knocks out creases and wrinkles faster and more efficiently. The higher the gram per minute rating of a steam iron, the easier and faster it is to use. You wouldn’t be left making pass after pass on a surface. At 200g per minute, the TDA5070GB delivers quite a decent volume of steam so knocking out wrinkles and creases take a much shorter time compared to lower steam volume competitors. One of the biggest hassles of ironing is, well, you have to do it. Wouldn’t it be nice if all your clothes were naturally wrinkle-free and you just had to unfold them and shake them hard to get them ready? Well, we don’t live in that perfect world-yet. We still have to iron materials like cotton if we want to look our best in the office or when stepping out for a social event. Considering how much of a chore most people consider ironing, consumers in the market for a new steam iron need to place a lot of weight on the comfort factor of the steam iron they are considering. At the very least, the steam iron you are thinking of buying shouldn’t weigh a ton or be a hassle to handle. At 998 grams, this model is not exactly paperweight. 998 grams is over 2 pounds and if you are already tired or stressed, you can definitely feel that you’re pushing and moving more than 2 pounds. To compensate, this Bosch model has a soft grip design that makes handling the unit easier and easier on your hands. Paired with ergonomic button design, this model’s easy handling does offset, to an extent, the hassle posed by its comparatively heavy weight. Whenever you deal with putting water in any piece of equipment, hard water or calcium deposits will always be a concern. Steam irons that have calcium deposits around their steam vents can become less efficient. These units can no longer process surfaces as smoothly as before as the deposits produce surface friction. Any unevenness in the iron’s surface area means more work-you have to make another pass to produce a smooth fabric surface. Calcium buildup can shorten the life of your iron dramatically. 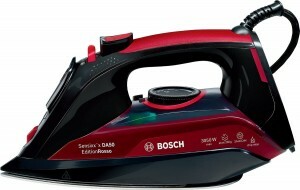 Considering the hassle calcium buildup poses, the Bosch TDA5070GB Steam Iron’s Anti-Calc feature is very much welcome. This technology works with the iron’s water cartridge system so calcium build up is arrested or slowed down. This ensures smooth water flow and extends the product life of this unit. While not ‘best of breed’ by any means, the Bosch TDA5070GB delivers decent value due to Bosch’s ‘Advanced Steam System’ which ensures uniform steam delivery. A bit on the heavy side, this model has enough comfort-boosting features so that it isn’t a chore to use. Finally, this model also uses Anti-calcium build up technology and design. This might seem like a small detail to many consumers but this is a big deal-this feature alone ensures that you’ll get to enjoy the benefits of this steam iron for a much longer time than competing models. That’s worth quite a bit of money as far as replacement costs and product life value are concerned.